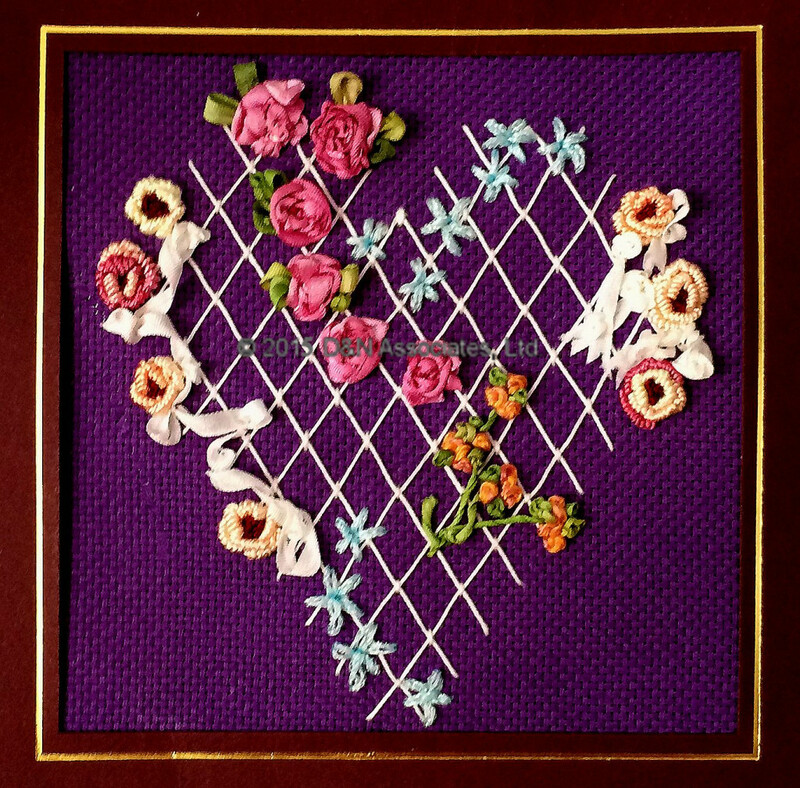 I used the lattice heart design from the Victoria Sampler Heirloom Wedding design as the back drop for a flowery silk ribbon Valentine’s Day card for my husband. Dark purple is my favorite color and I thought my husband would like the dark reddish-brown card plus the colors that I choose for the flowers were colors that I thought he would liked. He gave me a funny look when I handed it to him and said I made this Valentine’s day card for you. His remark, “It’s a lot of purple.” I thought was funny, I don’t even think he at first saw the embroidered flowers! just that purple is my color not his. Oh, well, men. Next year I’ll make him a rustic color bargello stitch design for a card, he’ll like that one a lot more as my beige-brownish range bargello worked piece is one of his favorites and sits on his computer table. The worked design is about four inch square. 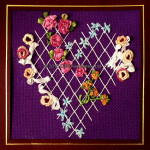 I used a 22 count purple even weave fabric and various threads and silk ribbon that I had on hand. The bullion roses came from the VS Heirloom Wedding design, other flowers are from various designs that I had worked or seen.